Hello lovelies! Today I have swatches of more polishes from Chicago Polish Con, this time in the form of a Glisten & Glow Duo. 'Shiny in Chi' and 'Shifty in Chi' were paired together at a great price at the convention, so they were a no brainer for me! 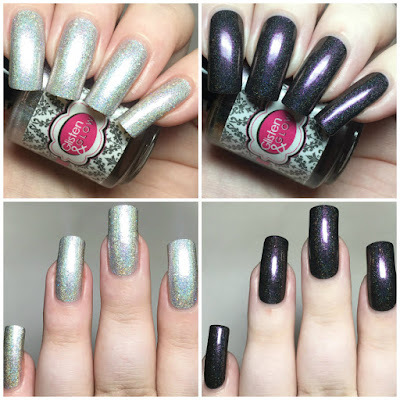 Both polishes are still available now from Glisten & Glow and UK stockist Rainbow Connection, so read on for more info! 'Shiny in Chi' is a light, bright silver holographic with silver holographic microglitters and a purple to copper shimmer. The formula is smooth and easy to apply. Being such a light silver, this does start off fairly sheer. 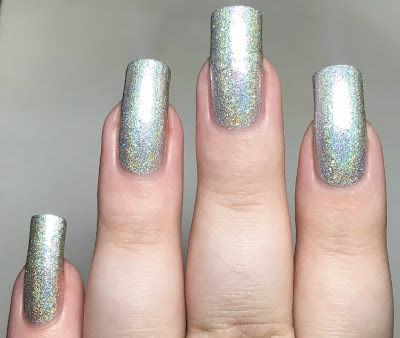 I was tempted to add a third coat but the holographic distracts from any minor nail line. Below is two coats with topcoat. 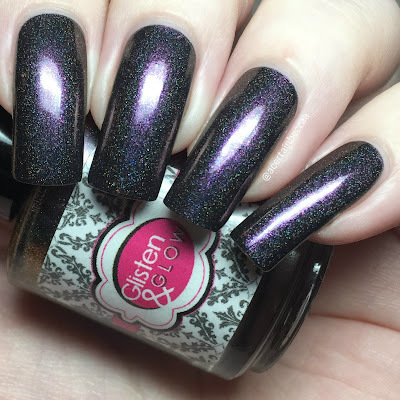 'Shifty in Chi' is a black holographic with a strong purple shimmer that shifts to the same copper. Again, the formula is smooth and easy to apply. The black base is slightly sheer and patchy after a first coat, but deepens up and covers completely with a second. The purple shimmer shows up really well on the nail. Below is two coats with topcoat. What do you think? I love how both are almost opposites, one super light bright, and the other a deep black, but have the same gorgeous shimmer running through to pair them together. 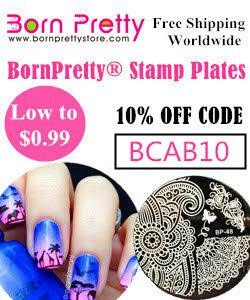 I've already used 'Shiny in Chi' as a base for nail art, which you can see in my UberChic Beauty Collection 21 post here. 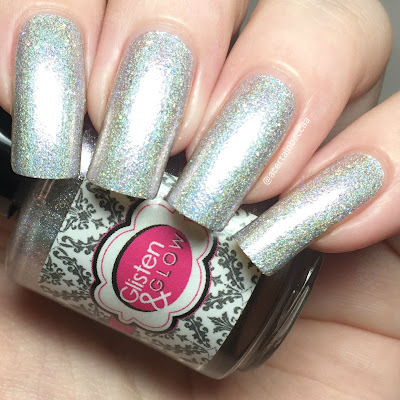 As mentioned, both polishes are available on the Glisten & Glow website - 'Shiny in Chi' here and 'Shifty in Chi' here. You can also find them on Rainbow Connection here.